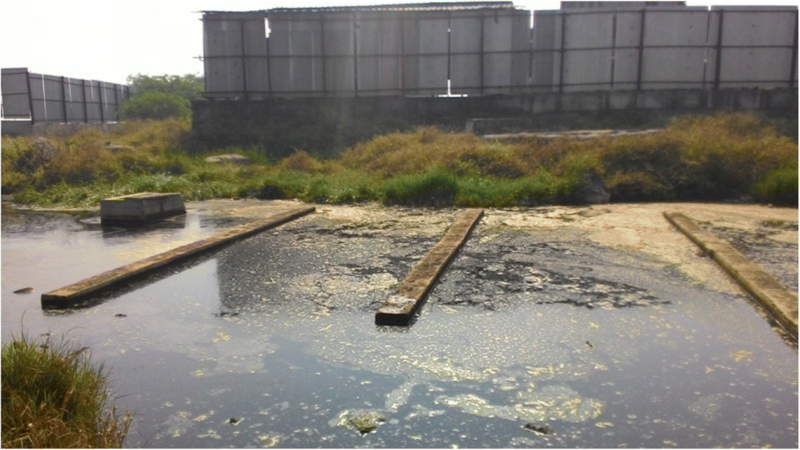 Improper management and unsanitary approaches are implemented in disposal of leachate, which has resulted in groundwater pollution at village Uruli Devachi, Pune, India. Various physico-chemical treatment methods are commercially available for leachate treatment. However, the application of biological methods viz. phytoremediation to the municipal solid waste landfill leachate has been limited. We report the remediation ability of Typha aungstifolia and Acrorus calamus that is capable of reducing hazardous constituents from the landfill leachate. After 96 h of hydraulic retention time (HRT), it was observed that T. aungstifolia-treated sample showed high reduction potential in reducing biochemical oxygen demand, chemical oxygen demand, hardness, total dissolved solids, Na, Mg, Ca and Ni whereas A. calamus showed greater reduction capacity for alkalinity, Cl, Cu, Zn and Cr. Furthermore, it was also observed that T. aungstifolia withstood longer HRT than A. calamus. In situ application of T. aungstifolia and A. calamus for remediation of landfill leachate carries a tremendous potential that needs to be further explored. Municipal solid waste (MSW) and its management have become a major concern throughout the world. Asian countries including China (Asian Development Bank (ADB) 2007), Nepal (Asian Development Bank (ADB) 2013), India, Bangladesh, Sri Lanka, Indonesia, Malaysia and the Philippines are facing severe difficulties due to unplanned and rapid urbanisation (Agamuthu and Tanaka 2014). For many decades, landfilling has been the most preferred waste management options in these countries. Most of the times, these landfills are open and unscientific and are located either in urban fringe or in the rural settings. MSW disposal in a landfill generates active biochemical substances in the form of leachates over a period of many years (Jones et al. 2006 and Erdogan and Zaimoglu 2015). Pollution caused by unscientific designs of the landfills poses a serious threat to biodiversity, soil, subsurface and surface waters and human well-being. Factors such as waste composition, decomposition rates, stability and meteorological conditions affect the composition of leachate; therefore, its quality is site specific, and variations are frequent (Jones et al. 2006). The downward movement and outward flow of the leachate transfer the contaminants to the groundwater and peripheral areas of the dump site respectively, thereby also affecting surface water (Papadopoulou et al. 2007). Furthermore, human health risks such as infections, skin irritation, nausea, vomiting and headache, while chronic exposure can led to anaemia, kidney damage and cancer, have been reported by various groups (Klinck and Stuart (1999); Raman and Narayanan (2008)) due to use of leachate-contaminated groundwater. There are many biological, physical, chemical and physico-chemical techniques to treat the leachate, which carries its own merits and demerits (Kamaruddin et al. 2015). Remediation using plants is one of the cost-effective and low maintenance techniques where the dynamics of organic and inorganic interactions are used to decompose and degrade potentially harmful elements in the leachate (Jones et al. 2006). Many species from the plant kingdom are known for their remediation abilities (Table 1); however, it is observed that the application of plant species for treatment of landfill leachate has been limited. Canna indica, Acorus calamus and Iris tectorum Maxim. Most of the available literature cites ex situ application of plants to treat the landfill leachate in constructed wetlands. Batool and Baig (2015) report the hyperaccumulation capacity of Typha sp. for Cu whereas Thlaspi caerulescens, Ipomea alpine, Psychotria douarrei, Thlaspi rotundifolium, Astragalus racemosus and Pteris vitatta show hyper accumulation capacities for Zn and Cd, Cu, Ni, Pb, Se and As respectively. (Oh et al. 2014); Baskar et al. (2014) have used Typha latifolia for treating domestic sewage at pilot scale. Bose et al. (2008) in a field study at Delhi applied Tyaha angustata L. to assess the uptake and transport mechanism of heavy metals in waste-amended soils in water logged condition. 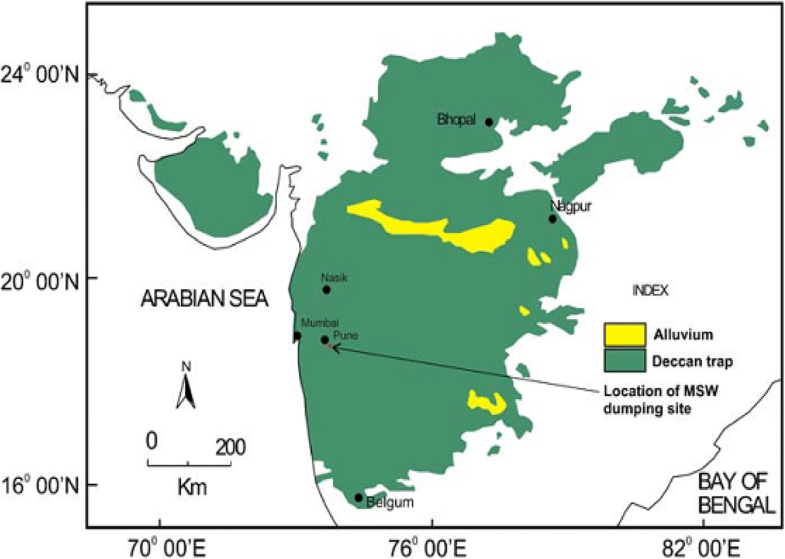 A phytoremediation study was performed at Pariej reservoir, Gujarat, where aquatic macrophytes viz. Ipomoea aquatica, Eichhornia crassipes, Typha angustata, Echinochloa colonum, Hydrilla verticillata, Nelumbo nucifera and Vallisneria spiralis were analysed for heavy metal accumulation (Sharma and Pandey 2014). Even though it is a promising technology, their full-scale applications for landfill leachate treatment are yet to be explored mainly due to their low remediation rate, longer treatment time and higher space requirement as compared with the other commercially available physico-chemical methods. However, its eco-friendly approach is gaining more attention as well as its efficiency in removing pollutants from waste waters (Oh et al. 2014). Therefore, identification and application of plants with higher remediation potential and faster rates is essential. Biological remediation of contaminated sites has been practiced for many decades, but the application of Typha aungstifolia and Acorus calamus to treat landfill leachate has not been reported in India. Therefore, this pilot-scale study was undertaken to examine the abilities of these plant species treating leachate from unsanitary MSW dumpsite. It also offers an important conservationist perspective by using native and easily available plant species instead of exotic varieties such as Eichhornia spp., causing ecological imbalance. The study area involves an unsanitary MSW landfill site at the village Uruli Devachi (UD), located approximately 20 km to the South East of Pune city, India (Fig. 1) (Lat. 18° 27′ 55.6″ N and Long. 73° 57′10.3″ E; elevation at 600 m above mean sea level.) The site is an open dump and being used for more than 20 years. The dump site receives untreated mixed MSW from the city of Pune (Fig. 2). It was estimated that the landfill site receives about 1050 tonnes per day of untreated mixed solid waste, whereas precise estimation of daily leachate generation is unavailable (Pune Municipal Corporation 2017). No scientific leachate collection was observed during the site visit undertaken 7 years after reporting of ground water contamination by Kale et al. (2010). The leachate is being collected in an unscientifically designed collection pond on the edge of the dump (Fig. 3). This is suggestive of possible leaching of harmful chemicals into the ground water. The sample was collected in pre-cleaned polyethylene containers of 20 L capacity. The pH and electrical conductivity (EC) were recorded onsite at the time of sampling using digital pH and EC meters, respectively. For the analysis of biochemical oxygen demand (BOD), a 300-mL capacity BOD bottle was used and dissolved oxygen (DO) was fixed onsite. For heavy metal analyses, the sample was separately collected in pre-washed polyethylene containers of 100 mL capacity. Spatial data was recorded using a Garmin (eTREX- 30X) global positioning system. T. angustifolia and A. calamus are both native to India. T. angustifolia is a marshy plant found on the margins of shallow lotic systems (Halder et al. 2014), whereas A. calamus grows on the margins of standing or slow-flowing water, typically in river backwaters, canal margins and the margins of ponds and lakes (Lansdown 2014). Both of these plants are readily available and easy to grow in marshy areas and have been used for remediation of various pollutants. Therefore, in order to explore their efficiency to treat landfill leachate, these plant species were selected. In order to deduce the best concentration level for leachate treatment, untreated samples were treated with the T. angustifolia and A. calamus in three different modes viz. control (raw leachate), 1:1 dilution of leachate to tap water and 1:2 dilution of leachate to tap water along with the control using only tap water. Statistical analysis was performed using Student’s t test (Microsoft Excel, 2010) between each of the treatment mode using standard settings in the software to check for the significance of the treatment for 48 h and 96 h of HRT respectively. The experimental setup was polyethylene containers with dimensions of 49.5 cm × 32.5 cm × 22 cm (L × B × H). These containers were filled with river sand (5 cm depth) at the bottom and the top layer of garden soil (12 cm depth). The sample was introduced from the top of the container, and water logged conditions were maintained for the period of hydraulic residence time (HRT). The bottom part of these containers had a control tap (outlet) to extract the samples as per requirement. The experiment was performed in triplicates using T. angustifolia and A. calamus in an open air laboratory (Figs. 4 and 5) resembling the landfill site. Every container contained pre-grown and acclimatised plants (six nos. ), where T. angustifolia had an average shoot height and root length of 45.5 ± 6 cm and 20.1 ± 2.5 cm respectively. A. calamus had an average shoot height and root length of 21.1 ± 2.5 cm and 7.5 ± 1.2 cm respectively before they were subjected to the experiment. Generally, the commercial waste water or leachate treatment units are operated on a shorter residence time with large influx of effluent. 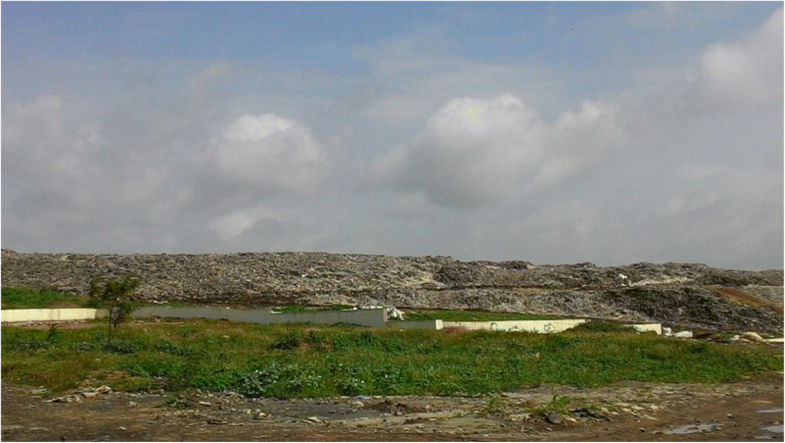 Similarly, at the landfill sites, the leachate is generated continuously. Hence, in order to simulate the field conditions, the HRT was maintained for 48 and 96 h, respectively. Immediately after sampling, the collected leachate was brought to the laboratory and refrigerated at temperature below 4 °C. BOD was estimated using the azide modification of Winkler method, while chemical oxygen demand (COD) was determined by open reflux digestion method. Hardness, alkalinity, Ca, and Cl− were analysed by titrimetry methods (American Public Health Association (APHA) 2012). Na was determined by a flame photometer (Systronic - model no. 128). Total dissolved solids (TDS) and total suspended solids (TSS) were analysed as described previously (American Public Health Association (APHA) (2012)). Mg and trace element viz. Zn, Cu, Ni, Pb and Cr concentrations were determined by multispectral inductive coupled plasma–optical emission spectroscopy (ICP–OES) (model: SPECTRO ARCOS- config. FHM22). The leachate sample was analysed for 18 physico-chemical parameters including the analysis of five heavy metals. The average leachate composition is shown in Table 2 along with the comparison with available literature and standards prescribed by the Government of India (GoI) under various rules and guidelines. The leachate composition shows variations since 2006 until now due to dumping of untreated mixed waste at the UD dumping site. Various leachate parameters viz. pH, Cl, TDS, hardness, Cu, Pb and Cr concentrations exceed the drinking water standards IS 10500:2012 (Bureau of Indian Standards (BIS) 2012) and parameters such as BOD, TDS, Ni, Pb and Cr against the standards for disposal of treated leachate (Ministry of Environment, Forest and Climate Change (MoEF& CC) 2016). Both species showed potential to reduce various leachate constituents after 48 h and 96 h of residence time respectively (Tables 3, 4, 5 and 6 and Figs. 6 and 7). Statistical analysis (t test, p = 0.049–0.01) shows that the experiment results are significantly correlated suggesting effective leachate treatment using two plant species. T. aungstifolia showed higher potential for BOD (up to 56%), COD (up to 59%), hardness (up to 28%), TDS (up to 9%), Na (up to 22%), Mg (up to 28%), Ca (up to 28%) and trace elements such as Ni (up to 18%) and Pb (up to 6%) whereas A. calamus showed higher reduction potential for alkalinity (up to 17%), chlorides (up to 3%) and trace elements viz. Cu (up to 15%), Zn (up to 8%) and Cr (up to 11%). Additionally, out of the two plants, T. angustifolia was found more robust and showed more resilience towards harmful components of the leachate. The landfill site at village UD is being operated for more than 20 years. The leachate generated at the dump site is disposed without any scientific intervention, where it percolates to the local aquifer and contaminates the groundwater. The characterisation of leachate undertaken herein demonstrates its potential of impacting the soil quality and groundwater in the surrounding areas. Therefore, it is necessary to scientifically design the landfill site to dispose of MSW and collection of hazardous leachate, which can be treated further and disposed without causing any harm to the environment. Remediation can be limited in case of plant application due to retention of chemicals on the soil particles. This may vary depending upon charge on soil and its respective adsorption dynamics. Further, the microbial consortium in leachate and soil may hinder or accentuate remediation in the wetland mesocosm. Pilot-scale application of T. angustifolia and A. calamus to treat landfill leachate demonstrates that both species were capable of reducing various pollutants from the leachate. The method provides a natural, cost-effective, low maintenance method to treat leachate. With appropriate pre-treatment of the leachate, both species would provide an effective alternative to the costly leachate treatment processes such as reverse osmosis. However, the process is slow and requires higher space for treatment as compared to commercial methods. 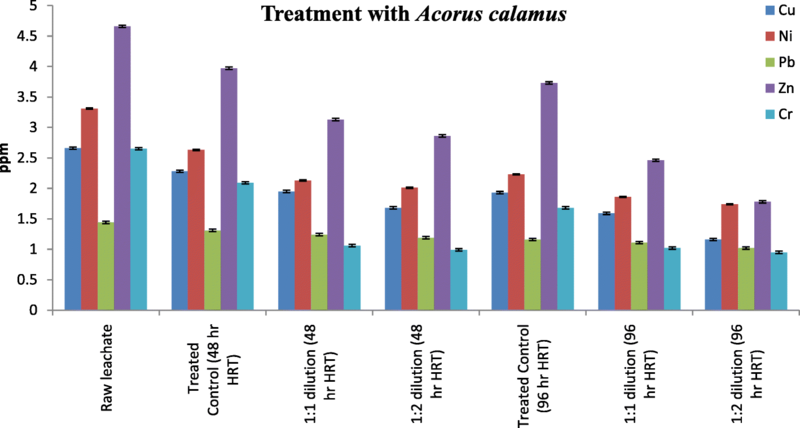 During the experimentation, it was also observed that T. angustifolia is more robust and capable of withstanding heavy loads of contaminants even after 96 h of residence time as compared to A. calamus. Direct disposal of untreated MSW landfill leachate on the open sites poses a serious threat to the community health and environment due to its harmful components. An appropriate landfill design would reduce the threat of leachate pollution by collecting it scientifically, which is also essential for leachate remediation. Herein, we show that plants have potential and offer an eco-friendly alternative for leachate treatment. Application of T. angustifolia and A. calamus has shown positive results in reducing hardness, alkalinity and Cl along with trace elements such as Cu, Pb, Ni and Cr in the tested samples. T. angustifolia was more robust of the two species and could sustain longer HRT. These results highlight the remediation potential of these two species, and hence, in situ applicability of these plant species needs to be further explored. We thank Professor Nitin Karmalkar, Vice Chancellor, Savitribai Phule Pune University (SPPU), and Professor Suresh Gosavi, Head, Department of Environmental Science, SPPU, for providing the access to all necessary facilities. The authors express their gratitude towards Professor Venkat Gunale for the continuous encouragement and support. RVB and DBB formulated the idea, drafted the manuscript and wrote the final text. RVB and RDC performed the experiments, and RVB analysed the results. All authors read and approved the final manuscript. Zhao L, Guo W, Li Q, Li H, Zhao W, Cao X. Capabilities of seven species of aquatic macrophytes for phytoremediation of pentachlorophenol contaminated sediment. IOP Conf. Series: Earth Environ Sci. 2017. https://doi.org/10.1088/1755-1315/51/1/012030.